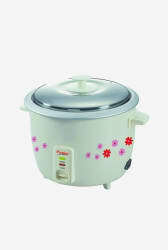 Featuring cool touch handle, this PRWO 1.8-2 700-watt electric rice cooker from Prestige will bring convenience to you. The stainless steel close fit lid will keep your food warm for a long time. The detachable power cord will make it easy to carry it anywhere.